The band created one of the most iconic songs of the 1980s, as pop with a rock edge became ever more radio friendly. American FM stations were increas­ingly format driven and '(I Just) Died in Your Arms' proved to be the perfect song for a wide variety of different format stations, each with their own focused identities, but all agreeing that this was a steller record. The single made No.1 on the Billboard Hot 100, and was a big hit on the Hot Mainstream Rock Tracks chart, the Hot Adult Contemporary chart and even on the Hot Dance/Club Play chart when it was remixed. In the UK it made No.4 and was a No.1 in many countries around the world. It also became Virgin Records first American big hit record. Cutting Crew were formed by singer, Nick Van Eede, from England and Canadian guitarist Kevin Scott MacMichael in 1985 after Van Eede had spent time in Canada with his band, The Drivers. In 1985, Cutting Crew, named after an article in the music paper Sounds described Queen as "a cutting crew", staged a showcase at a London recording studio for representatives from numerous labels; Siren Records, part of Virgin Records, signed them to a recording contract. Their first single was '(I Just) Died In Your Arms', which was released in the UK in August 1986 and soon climbed to No.4 in the charts. Success in many countries around the world made Virgin keen to release the record in America but they wanted a remixed version that was more radio friendly. It worked and in May 1987 it reached No.1. The single was included on the band's album Broadcast that came out after the initial UK release of '(I Just) Died In Your Arms' and after the success of the single in America it sold over half a million copies. The album also included another US hit, 'I've Been In Love Before'. 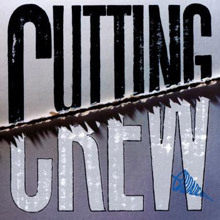 Cutting Crew's next album was The Scattering that was released in early 1989. Its lead single, '(Between a) Rock and a Hard Place', made the lower reaches of the charts on both sides of the Atlantic and was followed by the superb, 'Everything But My Pride', that became a big hit on the Adult Contemporary charts but failed to make the Hot 100 in America, it's difficult to understand why it did not do better, it's a record that just gets better with age. The Scattering is an even better album than Broadcast, but without a big hit single it did not do as well as it should have. In 1992 their third album Compus Mentus disappeared without trace after Virgin had already made a decision to drop the band, and released it more for contractual reasons than commercial concerns. It's another very good album that includes the excellent, 'Frigid As England' and 'If That's The Way You Want It'. In 1993 Cutting Crew broke up and MacMichael recorded and wrote with Robert Plant, and played on his Fate of Nations album. On New Year's Eve 2002, MacMichael died of lung cancer in Halifax, Nova Scotia, at the age of 51. In 2005 Van Eede reformed Cutting Crew and released the album, Grinning Souls. The band toured extensively and continue to do so and Van Eede has written and recorded a new Cutting Crew album that is scheduled for release in early 2014. Cutting Crew never deserved the hacking they received from critics. Music reviewers lined up to throttle Cutting Crew's debut album, Broadcast, when it was released in 1986. The slick guitar rock on Broadcast may not have wowed the rock &amp; roll intelligentsia, but it's a guaranteed crowd-pleaser, an underrated collection of simple, heartfelt love songs and up-tempo pop that reside between the stylistic boundaries of new wave and mainstream rock. 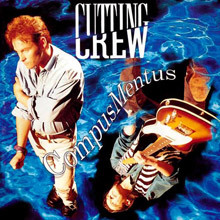 "(I Just) Died in Your Arms" and "I've Been in Love Before" immediately thrust Cutting Crew onto the U.S. charts; however, both songs aren't sufficient in summing up Broadcast's appeal. Nick VanEede's soulful croon is mesmerizing on "Any Colour" and "Sahara"; instead of bludgeoning the microphone with vocal histrionics common to late '80s rock, VanEede is thankfully restrained, imbuing every track with ample emotion. "Any Colour" should've been Cutting Crew's third hit, a moving tale of loneliness that easily draws the listener in, while the lovely "Sahara" captures the subtleties critics claimed Cutting Crew wasn't capable of. "One for the Mockingbird" and "Life in a Dangerous Time" are armed with stellar hooks. Cutting Crew somehow manages to incorporate guitar solos with the propulsive rhythms of U2 and the Fixx and the moody angst of Tears for Fears without sounding forced. Broadcast is not a creative breakthrough; it's simply an LP absent of any filler. Compus Mentus is a very rare cd which is hard to find at the moment.I like all the cutting crew material including this one. Many people rate this cd as there poorest effort,but i think it's great! some excellent tracks and a cd that is very well produced (at a high cost)And nice to see the Cutting Crew back on tour! a great sounding band. 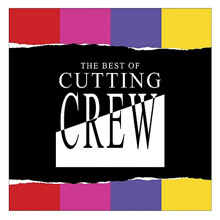 This is a straight reissue of the original Cutting Crew best-of, which appeared in 1994. Still on import (this time appearing through EMI), The Best of Cutting Crew leaves the sequence and track listing unchanged, but does marginally update the cover art. Also -- perhaps tellingly -- its uncredited liners now include a plea to end illegal downloading. Musically, the set is still comprehensive, both for casual listeners and completists. "(I Just) Died in Your Arms" is here, and its whispery synths still kill. Don't worry about the "extended remix" -- inexplicably, it's only seven seconds longer. But "Any Colour" is quite capable synth pop, and the propulsive "One for the Mockingbird" is perfect for practicing that Molly Ringwald shoulder sway. The latter fades nicely into the ballad "I've Been in Love Before," a pillowy gem that still occasionally finds its way onto lite rock play lists. By the time Cutting Crew released their second album in 1989, they were viewed as irrelevant by both critics -- who always despised them anyway -- and the fickle public that elevated "(I Just) Died in Your Arms" and "I've Been in Love Before" onto the pop charts two years earlier. The cold shoulders which welcomed The Scattering were most likely due to the lack of immediately catchy songs; nevertheless, while The Scattering doesn't have ear candy like the band's hit singles, the music is less-blatantly commercial and more personal. It's still slick stuff -- big '80s synthesizers, glossy FM radio guitars, in-your-face drums -- but Nick VanEede's vocals have a frosty glow that creates a mood and sustains interest. (The resemblance of his voice to Rob Dickinson's of Catherine Wheel has yet to be acknowledged.) "Big Noise" and "(Between A) Rock and a Hard Place" aren't as heavy as their titles suggest; however, they sound great on the highway, as guitarist Kevin Macmichael lets it rip without pounding the listener into submission -- something the grunge groups who permanently jettisoned bands such as Cutting Crew from AOR stations in the '90s enjoyed doing. The Scattering will probably seem dated to anyone who isn't an '80s enthusiast, but it's tasty nostalgia for people who remember the decade fondly. 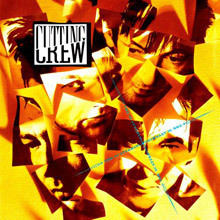 Cutting Crew were obviously infatuated with the arena-sized riffs of U2 and Big Country, and while the group doesn't reach those bands' creative heights, hook-packed material such as "Everything but My Pride" and "Tip of Your Tongue" finds them walking tall. Yacht Rock is a term that refers to a golden age of American artists from late 70s and early 80s, whose focus was on making studio magic. Bands like Steely Dan, The Doobie Brothers, Hall & Oates, Toto and The Eagles, whose members had a history in session work, and who held recording prowess in the highest regard. Having once being knocked as a kind of yuppie cheese, Yacht Rock is enjoying something of a renaissance. The sounds are escapist, soulful and smooth, with huge harmonies and intricate studio mastery so precise it makes the eyes water. Skill is something that s undeniable amongst the Yacht Rock greats - musicianship was a huge part of the scene. It even inspired a pastiche mockumentary , originally aired on American station 101 with a bad on purpose aesthetic and a cult following. 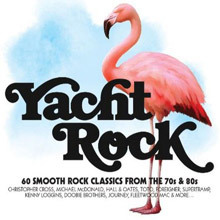 This album acts as the perfect introduction to Yacht Rock , and brings together the best artists from the genre.